Before the birth of Jesus the prophet Isaiah records these words. Somewhat prophetic, in hindsight of what we understand about Jesus. He is a wonderful counselor, his is a mighty God, he is an everlasting Father, and he is the ultimate Prince of Peace. Thanks God for these descriptors and reminders of the nature of who Jesus is. 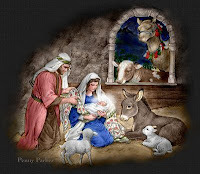 Have a happy and blessed Christmas. Jesus transforms lives and so we celebrate his birth this year. We pray many might come to understand the love and forgiveness of Christ in their own life this Christmas time. A weekend to remember. I'm still trying to work out how to spell lieutenant! Thanks to all our family and friends who have supported us over this weekend, and in the last two years. What a journey for Jo and I. Thank you for your prayers and encouragement. And the answer to the question is, 'No, Jo hasn't had the baby yet...' Maybe tomorrow?! Well, Jo and I are excited. We're off to Palmerston Corps, and are looking forward to the friendships, and joy we'll experience up north. God is good, and we aim to serve him faithfully and passionately, and our prayer is that the gospel of Jesus will transform many lives into the future. There's still a few weeks of College left. Packing. Cleaning. Carolling. Brass bands. Farewells. Cleaning. Packing and many, many goodbyes. God bless the future. God bless The Salvation Army.